Most people I see who are ‘trying’ to improve their posture, start to force their shoulders down towards the ground or pull them back through the day. When that feels painful or unnatural, you don’t keep it up and feel bad that you can’t. Sometimes you might even be causing more tension in the jaw and neck by straining the shoulders into a downward position. For me, there is no such thing as a one size fits all, perfect posture. It’s more personal and based on goals. Instead of thinking about the shoulders, people should put awareness in other parts of their body, allowing the posture to gradually follow. Perhaps try thinking about your posture in a new way. Would you like to have less jaw pain, headaches or lower back pain while sitting at a computer? How about feeling elegant in your strappy dress at an upcoming wedding this summer, or at work feeling energised and powerful? Believe it or not, how we stand and sit affects us both physically and emotionally as well as how others perceive us. Do you look at and notice your posture? Others do, more than you think. People with a rounded shoulder or head stance tend to be perceived as depressed or lacking in confidence, whereas others who carry their head high and have an open chest tend to be trusted more and thought of as more capable, confident and happier and even sexier. In the longer term, where the shoulders are severely stooped the organs over-time can get crushed and stop working as well as they should and the joints can become painful and stiff, leading to problems with the whole body and feelings of tiredness and lethargy. How you hold yourself can be to do with muscular habits built over years of desk work or even how we sleep. Sometimes different postures can run in families, or we can unconsciously twist or favour one side of the body over the other limping or holding yourself differently from an injury as your body tries to recover. Once you’re aware what position your muscles are in you’re in the perfect position to make a choice about where you’d like them to be. 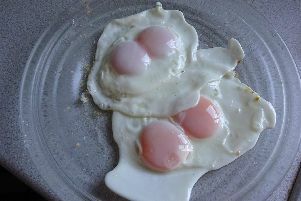 Your view: Can readers crack the puzzle of this double yolk egg calculation?